Shorebirds are birds that inhabit or visit the shoreline. Grays Harbor is one of the most important staging areas for shorebirds on the entire Pacific Coast. The species of shorebirds most commonly seen around Grays Harbor include sandpipers, dulins, dowitchers, plovers, and turnstones. Some species of shorebirds can be found in the Grays Harbor area year round, and others visit the area during their migration. Each spring, hundreds of thousands of shorebirds stop to rest and feed in Grays Harbor estuary on their migration northward. Coming from as far south as Argentina, these Arctic-bound shorebirds are among the world's greatest migrants. Some birds travel over 15,000 miles round trip! Tens of thousands of shorebirds feed on the open mudflats in the estuary. This concentration of birds offers people a great chance to view a number of shorebird species, and with luck, to see the birds fly together in beautiful formations. Occasionally, raptors such as peregrine falcons and bald eagles can be seen hunting the shorebirds. One of the best places to view shorebirds is from the Sandpiper Trail at the Grays Harbor National Wildlife Refuge. An excellent free brochure is usually available at the head of the trail with pictures and descriptions of birds, plants and migration maps. The best time to view large groups of shorebirds is around the high tide, usually from about 2 hours before and 2 hours after high tide is best. When the tide is high, shorebirds gather closer together and are more concentrated for better viewing. The peak in migration typically occurs the last week in April. 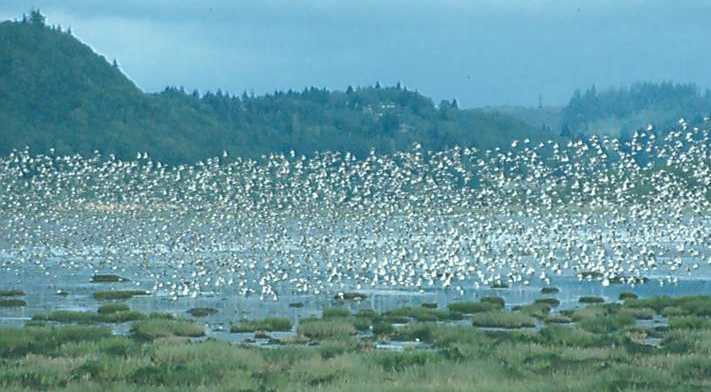 The Grays Harbor Shorebird Festival is held each year during the peak migration period. More information about the Grays Harbor Shorebird Festival can be found at shorebirdfestival.com. This page was last modified on 11 May 2010, at 22:13.